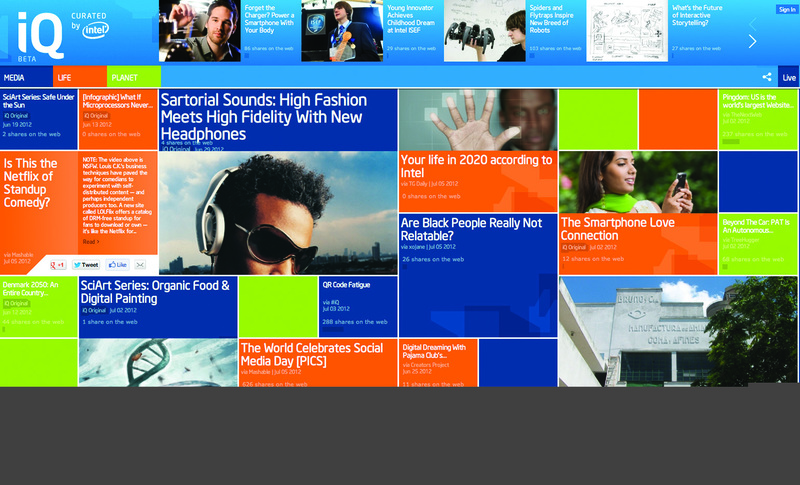 Intel’s new digital magazine offers a peek at the outer edge of design, technology, social and big data. CCO magazine interviewed Bryan Rhoads, editor in chief, to find out why IQ matters. CCO: What’s different about IQ? Bryan Rhoads: IQ has a very intelligent back-end. We developed an algorithm to curate social content in a way that leverages our employees. We want to publish what they’re sharing and what’s grabbing their attention. It’s a combination of a social algorithm, plus an employee filter that crowdsources what they are saying and sharing, and uses that as a discovery tool. Was employee-content crowdsourcing always part of the plan? BR: We’re blessed with a deep bench of very active social media practitioners across the world, driven in part by a very open social media policy. We decided to use our natural advantage — very smart and social engineers, scientists and visionaries — to build this new social property. Tell us more about the strategy behind IQ. BR: We already generate really interesting content, but it’s never been aggregated and curated in one space. IQ grabs that really good content — including content our employees are sharing from sites like Mashable, Wired, and Spin — and then feeds it through this new interface. IQ represents the zeitgeist of Intel. Our strategy is not to create a destination, but to feed the social graph. You’re not going to pour your morning cup of coffee and go dial up IQ.Intel.com. Instead you’re going to see our stories on Facebook, Twitter, Google+. It’s a platform built for sharing. For such a technology-driven publication, what’s the role of the chief editor? BR: I’m looking at the demand side of the equation. What will the audience really want to consume? What do they want to share on Facebook? I’m always trying to think more like a publisher than a marketer. What inspires you and, indirectly, inspires the project? BR: IQ is inspired by Moore’s Law, which says the number of transistors that can be placed on a circuit will double every two years. Moore’s Law also defines every aspect of our modern lives and how we live with technology. That’s the story IQ is telling. We really take it for granted, how magical some of this everyday technology is. That’s what inspires me also. I used to do research with MIT and every time I go to the MIT Media Lab, I’m inspired by that geeky, anything-is-possible attitude. That’s what IQ is about and that’s what Intel is about. How do you measure whether IQ is meeting your goals? BR: I’m less concerned with visits. I look at participation: sharing, comments, “likes” and retweets. That shows me the content was successful. What’s the next move for a publication on the forefront of technology? BR: Being Intel, we have line of sight. We know what’s next as far as devices, computing technology, even things like gesture recognition. Those are all advances being worked on in our labs, and that’s what we want to capture in IQ . For example, we think new laptops this time next year will be touch-enabled through Windows 8, and that’s why IQ is designed as it is. IQ functions like a mobile web/native app hybrid, and that’s where things are going. That’s where we’re taking IQ . 1. The employee-driven curation engine: Intel counts top visionaries in social technology and engineering among its employees, along with a large army of social-savvy employees. Why not let these experts drive what content is interesting and new? The content that lands on IQ is based on what Intel’s employees are reading and recommend. Some of it is Intel-authored, and other content is curated from sites like Wired, Mashable and Spin. 2. A “touch-optimized” design: Intel knows that with so much social media browsing taking place on smartphones and tablets, a touch-optimized design makes the most sense. The site, with its graphic “tiles” of content, looks a lot like a Flipboard interface and can be navigated easily whether you are browsing from a smartphone, tablet or desktop. 3. An understanding of visual content: Because IQ is designed for sharing through the social graph, each IQ article is paired with photography or artwork that shows up clearly when you see a preview through your social feed (i.e., shows up clearly whether it is viewed as a small-scale “thumbnail” or in a larger format). 4. The right measurement ethos: Bryan Rhoads, IQ’s chief editor, explains the site is not intended to be a destination. Instead, Intel measures social engagement through metrics like sharing, comments, “likes” and retweets. While some publications are still hung-up on traffic, Intel is more attuned to how well content travels through your social feeds. Want more content marketing inspiration? Download our ultimate eBook with 100 content marketing examples. Clare McDermott is the co-founder and head of strategy at Mantis Research. Follow her @clare_mcd.